When it comes to making an accurate shot, whether hunting or sports shooting, having a good sight is mandatory. While the traditional iron sight gives an accurate shot, the red dot sight makes aiming faster with less missed shots. Red dot sights are typically military optics, however civilian shooters like the red dot for hunting and recreational shooting. The most popular red dot use is moving target aiming. A red dot lets you line up and sight the target and quickly take the shot. Continue reading our review for help choosing the best red dot sight that suites your needs. Red dot sights are the first optical upgrade most gun owners make. The sight’s popularity comes from a combination of low entry-level price and improved aiming ability. Any shotgun, rifle, or handgun sight that is an illuminated, non-magnified optical is known as a red dot sight. Red dot sights incorporate several different technologies including fiber optics and holographic reticles. These sights use red, sometimes green, circles of various sizes. The dot, or chevron, aligns with the target aiming directly at the line of sight. This lining up of the gun to the target helps the user make the perfect shot. The Kansas based optics company, Tasco, continues its reputation for bargain-priced optics with their .22 Rimfire sight. 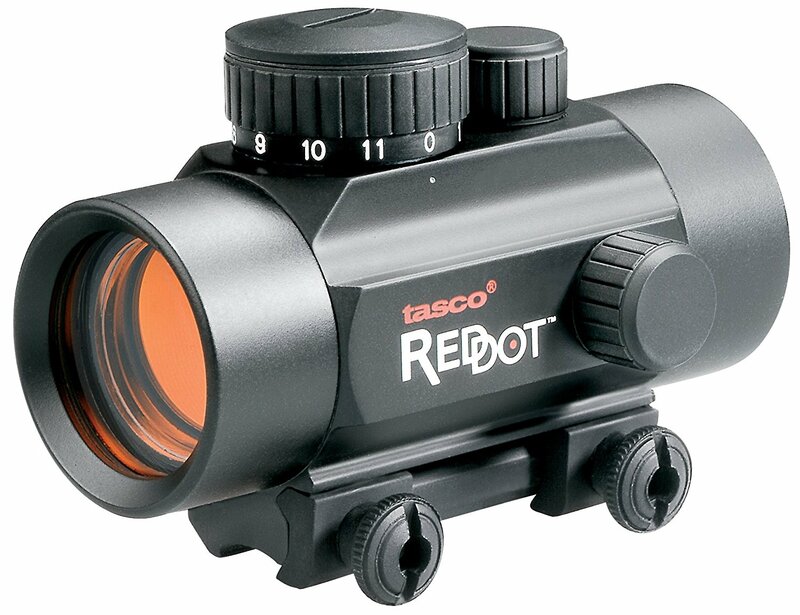 This Tasco basic entrant to the world of red dot sights is a great choice for heavy glare conditions like desert or snow shooting. With a 30mm objective lens housed in a 3.75-inch tube, the Rimfire is a durable optic under adverse weather conditions. The long 3.75-inch tube length by 1.5-inch diameter and 6-ounce weight makes the Tasco Rimfire a good AR-15 optic. The Rimfire parallax has a 50-yard fixed red dot for staying static relative to the eye position. As on all red dot optics, you never have an eliminated parallax, only a reduced one. Night shooters get eleven brightness settings with a standard 5MOA red dot reticle. The 30mm objective lens diameter of 1.25-inches delivers a 57-foot field of view at 100 yards. Multiple layers of Tasco’s Rubicon finish fully coat the objective lens. This unique coating filters out harsh reds from the light spectrum making it suitable for bright daylight glare. Even though the Rimfire is not waterproof certified, the assembly has an all-weather, matte finish for environmental hazards protection. An integrated dovetail mount adapts to any centerfire Weaver mount. The scope rides low on the mounting rail so you may need a riser for mounting the Rimfire in line with an AR rifle iron sight. Pairing the Rimfire with an offset iron sight is a great option. 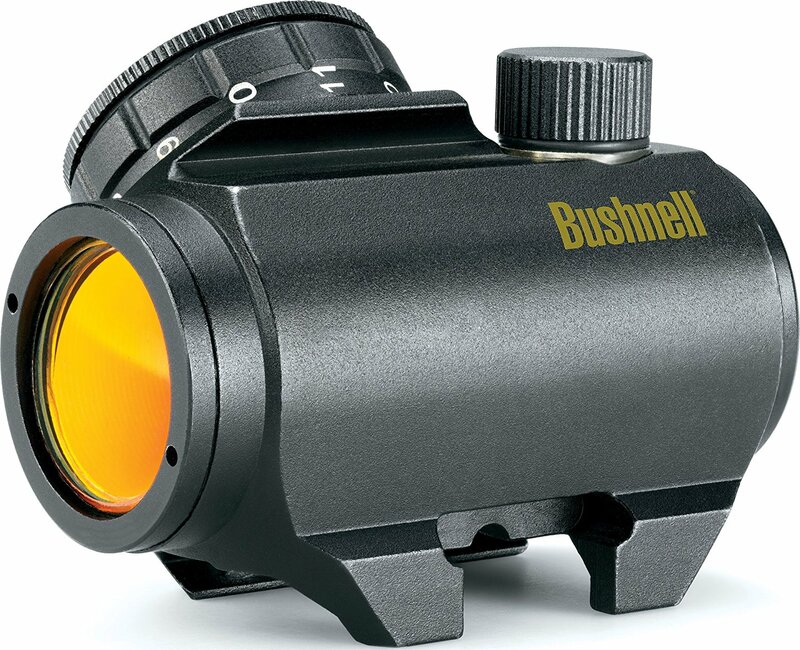 Bushnell has a reputation in the optic industry as one of durable quality. The Bushnell Trophy TRS-25 Red Dot Sight is no exception. Another in a long lineup of optics, the TRS-25 gets top reviews for its performance, reliability, and high-quality construction materials. An excellent red dot starter sight, the TRS-25 has a 3MOA reticle that gives you great grouping at 100 yards. With a 25mm diameter, the objective lens is smaller than other red dots, but it also has a lower profile. With the Amber-Bright coating for contrast enhancement between the target and background, the lens size doesn’t matter as much. Windage and elevation adjustment knobs remain protected under waterproof caps to the right side and top of the scope. Even though you need a screwdriver, the adjustments are easy with a positive click for each MOA turn in reticle shift. The ½ MOA clicks make zeroing quicker and offer lots of adjustment precision. Easy brightness adjustment comes from the large dial, with eleven different settings, located on the side of the sight. Rounding out the TRS-25 features is its compact size of a 2.4-inch length and a weight of 3.7 ounces. The scope has a solid mount on Picatinny or Weaver style rails and comes in as a top pick for a first-time all-purpose scope. Famous for their rugged built, bulletproof optics, Burris offers a mil-spec optic with a compact prismatic design. Being a cross between scope and red dot sight, the Burris’ AR-332 packs tons of functionality in a basic red dot. 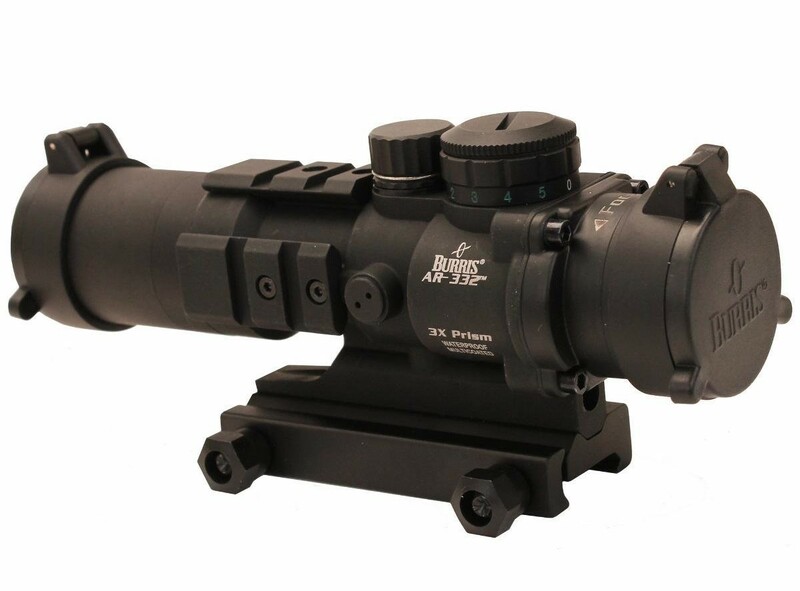 The Burris AR-332, combat rifle optic has a 32mm objective lens with 3x magnification and a great field of view. Target acquisition and handling are fluid and fast, perfect for competitive and tactical conditions when seconds matter. A donut reticle gives you more precise speed than duplex reticles at varying distances. Each reticle of the AR-332 comes with five illumination settings and a choice between a red or green reticle. When using the AR-332 in close quarters, you get easy shots by simply filling the target into the broad reticle. The mil-dot crosshair helps with making range adjustments for fine tuning precision. Even when shooting in direct sunlight, the illuminated reticle is bright and visible. Dedicated points going from 100-500 yards gives this sight more precision than a single duplex style reticle. Also, Burris adds three removable Picatinny rails for mounting lights, lasers, and other optics for even more enhancement. Like other Burris products, the high-quality AR-332 features a fog proof and weatherproof build with crystal clear optics. With the removable Picatinny mounting system, you get straight from the box use for your AR-15. The name Infiniti refers to the long, almost infinite battery life you get from the Holosun Infiniti Red Dot Sight. A single CR123A battery delivers up to 50,000 hours of electronic sight usage or about five years constant use. This factor alone puts the Infiniti ahead of the competition in this same economical price range. In addition to the long battery life, the Infiniti has a power saving auto-shutoff mode. After eight hours of inactivity, the sight shuts down. Auto shutoff is a great feature when you forget to turn the sight off before locking up your rifle. A 2MOA red dot reticle and side mount green laser adds extra aiming abilities alongside the twelve different brightness settings. Of the twelve brightness settings, two are for night vision and are compatible with all generations of night vision devices. Parallax-free with unlimited eye relief, the Infiniti includes elevation and windage adjustments at .5MOA per click. Another quality feature of the Infiniti is its waterproof ability with complete submersion up to one hundred feet. With the submersion feature, you have a waterproof sight that resists damage when using in wet and soggy conditions. Along with being waterproof, the Infiniti is a reliable and sturdy AR-15 aiming solution with its single body aluminum construction. The Holosun Infiniti has features similar to the Aimpoint Pro Patrol Rifle Optic. You get the new technology for better focus and target acquisition for less than the Aimpoint Pro Patrol Optic. 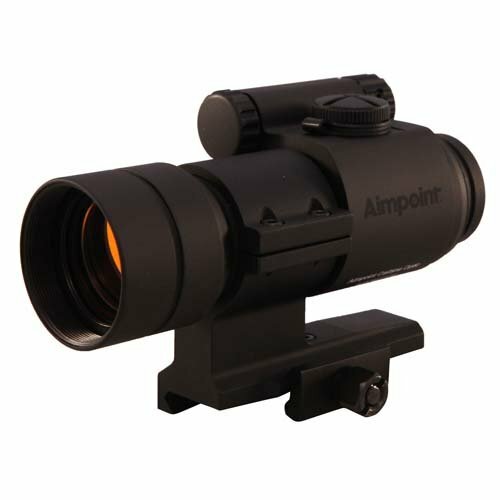 Aimpoint, known for military and police rifle enhancements, delivers a top quality red dot with their Aimpoint Carbine Optic Sight. This state-of-the-art red dot sight leads the industry in optics for dealing with any situation in the field. The Carbine is a sight even more rugged than other Aimpoint products with its high strength, hard anodized aluminum build. A non-glare, black finish makes the Carbine perfect for stealth operations. Add the scratch-resistant, replaceable external rubber cover and you have a sight that is perfect for shooting in any environment. For the modern sportsman, the Carbine comes ready to mount and shoot, straight from the box. The 300mm aluminum alloy sight tube and rugged fixed height mount give you absolute co-witness with the gun’s iron sights. The integrated mount design makes the Aimpoint Carbine a great optic choice for sporting rifles. A 2MOA red dot allows maximum speed for target acquisition and superior accuracy at any distance. You get an unrestricted view and zero parallax with unlimited eye relief. The mechanical switch and optical lens coating deliver a quick and reliable sighting operation with ten dot brightness adjustment settings. The ACET and exclusive Aimpoint technology give the single DL1/3N battery up to one year of constant on use. The beginning shooter gets lots of shooting instructions thrown at them every day like, sight your target before touching the trigger. Place your feet correctly while leaning forward slightly. Focus on the front sight and exhale to find a natural pause, and so on. These instructions are all good, but when you add nervousness or a common fear of the recoil and muzzle blast, everything becomes overwhelming. For a new shooter to enjoy success and have some fun, it’s essential to make the process as simple as possible. Using a red dot sight is an excellent accessory for making the beginner’s life a little simpler. Traditional methods have always leaned toward learning to shoot through iron sights before moving to advanced optics. However, modern thinking points toward teaching beginners to hit the target for a better and more enjoyable experience. Science proves the brain learns from making the hit, not missing it and the red dot optic helps lessen the learning curve. Using a red dot optic makes the learning process positive and rewarding by helping the shooter hit early and often. With the available red dot optic mounting solutions variety, you can attach one to most firearms. Whether you use a handgun, shotgun, or rifle, your shooting can benefit from attaching a red dot sight. Red dot sights are durable, lightweight, and compact with simplistic operations, all for a moderate price. The biggest concern when it comes to red dot sights is determining the best one for your planned use and budget. There are many features to consider when choosing a red dot sight. However, there are four features we consider the most important when picking out your red dot sight. Red dot sights come in two styles, tube or open style. A tube style red dot sight looks very similar to a standard sight. Tube housing lets the shooter add protective covers and filters to the optic lens. These filters give you an advantage in bright sunlight that makes it easier to see the red dot when targeting. Open style sights, do not have the classic tube style and consist of just the bare minimum basics. These basics include an objective window for sighting with a source of illumination. Since the open style has less room than the tube, you can’t add filters or protective lens covers. With a red dot sight, you can choose from a reflex sight or holographic sight. The reflex sight projections are the most common projection found in red dots with recreation for their basic use. Reflex sights reflect LED light, which is located behind the lens, and directs it into the shooter’s sightline. The objective lens is a partial mirror that prevents most of the light from passing through. When using a high-quality reflex sight, the lack of light is hardly noticeable. In the reflex sight, the reflective lens coating reflects only the light wavelength emitted by the reticle illumination system. 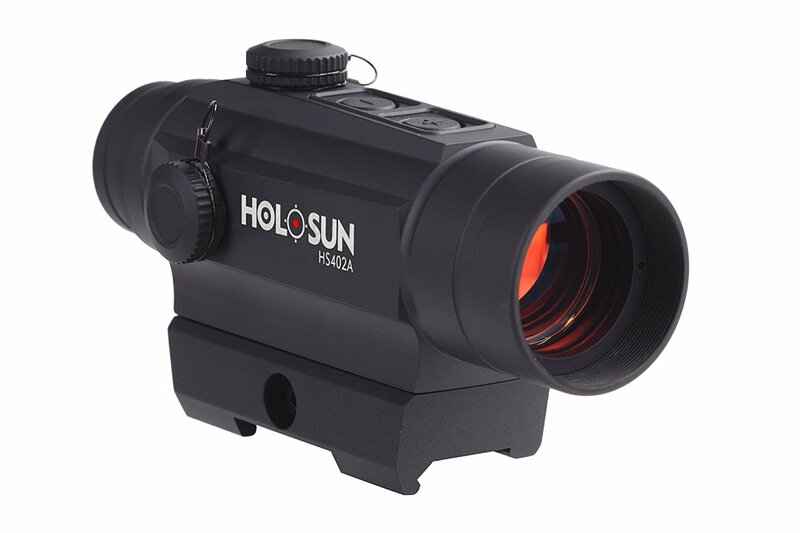 The holographic projection differs from the reflex sight in that the illumination comes from the front of the lens. In this setup, a laser diode light projects onto the viewing window and creates a holographic red dot. In simple terms, this means a laser light application takes a photograph of the reticle. The hologram, sandwiched in the glass, forms a viewing window and assists the shooter with aiming at their target. In the field, the holographic and reflex sight have completely different technologies that are used for the same reasons. When you talk about the reticle, you’re referring to the red dot used for bringing the gun into line with a target. While all reticles illuminate for easier shooting in low light conditions, they aren’t always red or even a dot. Since the red dot patterns and colors vary, you want to find the one the will allow you the most comfortable shooting experience. The optical patterns can range from one dot to crosshairs, or a bullseye pattern. Colors can also vary in red, green, blue or some sights give you a choice of all three in a single sight. Higher end sights not only allow for different color adjustments but also have multiple dot pattern style choices. You can also adjust the reticle size to suit your targeting needs. Normally, the larger the dot, the faster the targeting. We advise avoiding the fancy style red dot patterns. You want your eye naturally aligned with the reticle center. The fancy dot patterns distract the eye and can cause an extreme slowdown in acquiring the target. Battery life might not come to mind when considering what red dot sight to buy. However, when you’re out in the field, you depend on the reticle showing up when you need it. If your battery has a short lifespan, you may lose the light when aiming at a target. If your reticle goes dark, targeting gets difficult, and accuracy suffers. LED reflex sights use less battery energy than those using a holographic option. When choosing the best battery life, you want a scope that delivers at least one thousand hours constant on use. Preserve your battery life by turning the sight off whenever possible. Cold weather shooting also affects the life of the battery. When using your sight during the winter, always carry a spare battery for backup. Having an extra battery on hand keeps you ready for anything. Once you purchase your first AR-15 rifle, your next step is looking for an optical upgrade. The hard part of buying an optic is you get a ton of choices. A red dot scope that’s right for someone else might not be a good choice for you. With all the styles and functions available, choosing is difficult. Here is a quick guide to help point you in the right direction based on your needs and budget. Just because a sight costs a lot doesn’t mean you’re getting higher quality with better features than the cheaper model. Advertising can draw you to an expensive red dot sight, but it’s missing some key features. A $500 sight may only have one pattern style with just one dot color. On the other hand, the $200 sight has two dot colors with three different pattern styles. Eye focus varies in each person. Having a sight that you can change the reticle shape and color makes a huge difference in your shooting experience. This is where comparing apples to apples when it comes to features makes a big difference. All red dot sights are not always compatible with any gun. Manufacturers design specific sights to go with a certain type of gun which won’t work with others. Be sure the sight you are considering is compatible with the gun you plan to mount it on. When buying a sight, having the right size is as important as buying one that is compatible with the gun. The sight weight affects the gun weight which has a direct effect on using the gun. If the sight is too large or heavy, you can’t effectively handle the gun with the sight attached. Without good handling, it greatly diminishes the speed and accuracy of the shot. You must accurately mount your new red dot sight. If the sight is even slightly off, it throws off your whole aim. Make sure the sight adapts to the right mounting system for your gun. Precise sight mounting helps you hit the target with each shot. For those new to choosing an optical upgrade for their firearm, the red dot sight is an excellent choice. When you have an extremely accurate firearm, like the AR-15, you want to pair it with a top-quality aiming accessory. The red dot sight turns your firearm into a formidable defense weapon with high-speed target acquisition and precise aiming. A red dot sight delivers far more accuracy and speed than a standard iron sight. There are virtually hundreds of available red dot sights on the market. With the many choices, you must make careful consideration for choosing the best sight suited for your desired application.